Nematanthus, commonly know as Goldfish Plant, is a genus of flowering plants of the family Gesneriaceae. All of its species are endemic to Brazil. The plant is generally an epiphyte in nature and a hanging-basket plant in cultivation. If you have a high light area that calls for a hanging or table plant that flowers, Nematanthus are a perfect choice. 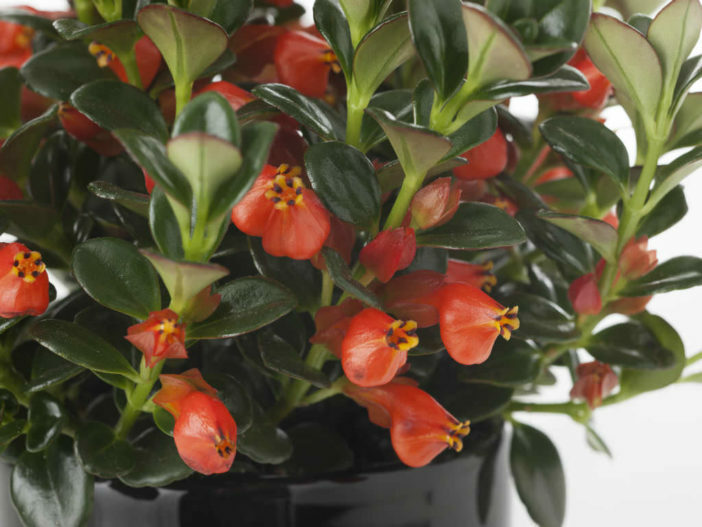 They have hundreds of small, thick, shiny, dark green leaves and colorful flowers that resemble tiny goldfish. The flowers on a Nematanthus may be red, orange, or yellow. Plants are easy to care for, drought resistant, and, with proper care, can bloom all year. Light: Place the Nematanthus in bright light, but protect it from direct sunlight. Put the plant a few feet away from a bright window, or place it next to a window covered with a sheer curtain. Curled leaves are an indication that the plant needs a bit more light. Water: Water the Nematanthus regularly, and don’t allow the soil to dry out. Water to the point that the soil is moist, but never allow the soil to become soggy. Pour water out of the drainage saucer immediately, and do not allow the bottom of the container to sit in water. Temperature: Keep the plants in a warm room and don’t allow temperatures to drop below 60ºF (15ºC). Don’t place the plant near heating vents or air conditioners, and protect the plant from cold drafts. Soil: It like a rich potting soil that holds water but still drains quickly. Fertilizer: Fertilize a Nematanthus every two weeks in the spring and summer when it is actively growing with a basic plant food at 1/2 the recommended strength. Feed the plant monthly in the fall and winter. Remove old flowers and prune back stems as needed to maintain size. Most are trailing plants grown in baskets and periodically they can be trimmed back to maintain the length of the stems. Repot overcrowded plants in a larger container, or divide them and pot them up in separate containers; this will increase your quantity of plants easily. Nematanthus have susceptibility to mealy bugs, cyclamen mites, aphids and thrip as well as whitefly. Under excessive moisture, they can have problems with root diseases. Propagate Nematanthus using stem cuttings from healthy new growth.